Pleasant Hearth non-catalytic wood burning stoves provide will warm your heart and your home with highly efficient and effective indoor zone heating. This stove has been EPA certified with a 85% efficiency rating with emission at 3.6 grams/hr. Perfect for single-family use with little assembly required. All Pleasant Hearth wood burning stove feature a brick lined firebox, chrome handles, air wash system for cleaner air, front-loading solid cast iron door with large ceramic glass viewing area, and a 5 year limited warranty. Stoves operate best when fuelled with seasoned cord firewood. Heating coverage area is up to 2,200 sq ft. The Deluxe Englander 2,200 sq. ft. Pellet Stove comes with stylish black louvers complemented by a stylish cool touch nickel door handle. Start the fire with a 1 - touch igniter and the user friendly control board helps you set the feed rate and blower speed to a setting that feels best for your home. The 60 lb. hopper holds a bag and a half of pellets and the stove uses a large 250 CFM blower to heat up to 2,200 sq. ft. through a durable, double auger feed system that promises years of dependability. WS-3029 2,200 Sq. Ft. Large Wood Burning Stove Pleasant Hearth non-catalytic wood burning stoves provide will warm your heart and your home with highly efficient and effective indoor zone heating. This stove has been EPA certified with a 85% efficiency rating with emission at 3.6 grams/hr. Perfect for single-family use with little assembly required. 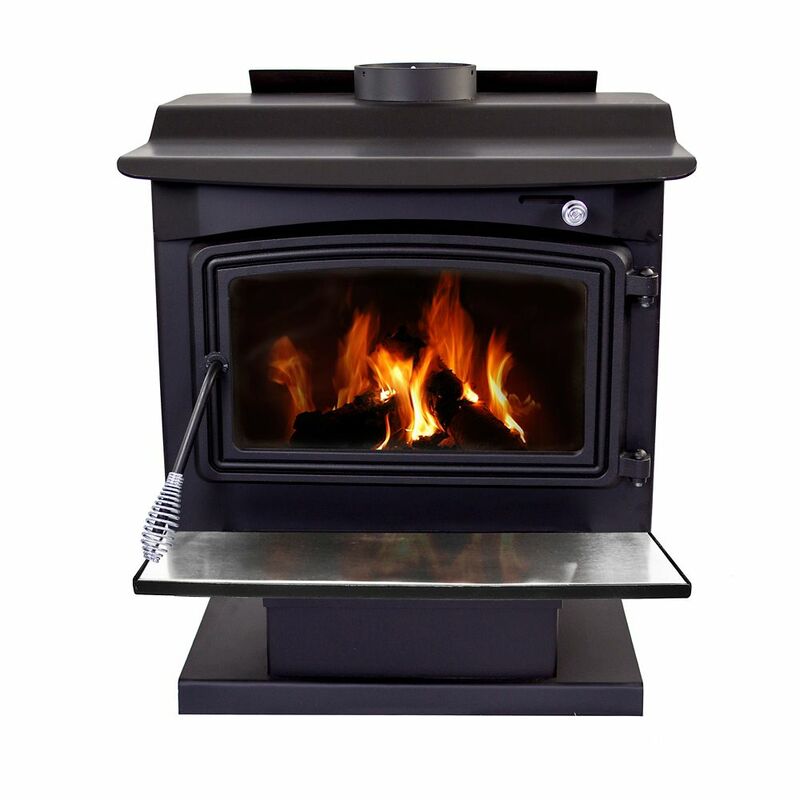 All Pleasant Hearth wood burning stove feature a brick lined firebox, chrome handles, air wash system for cleaner air, front-loading solid cast iron door with large ceramic glass viewing area, and a 5 year limited warranty. Stoves operate best when fuelled with seasoned cord firewood. Heating coverage area is up to 2,200 sq ft.
WS-3029 2,200 Sq. Ft. Large Wood Burning Stove is rated 4.8 out of 5 by 12. Rated 5 out of 5 by HomeDepotCustomer from Great looking fire!... Great looking fire! Rated 5 out of 5 by KBUNK from This stove has been really good so far. Never have... This stove has been really good so far. Never have any problems lighting or keeping it burning. Rated 4 out of 5 by Brian from You cannot beat this stove for the price. The only... You cannot beat this stove for the price. The only reason I gave this four, instead of five stars, is because the inside of the box is only 12” high. It would be nice to have another 3-4 inches of room so you won’t be trying to squeeze and force a big block on top of burning coals. Rated 4 out of 5 by Anonymous from Wood burning stove We have not used it yet. Just got it installed. Will find out how it works this winter. I will say, it is smaller than I thought it would be. I hope it heats like it says it does! Is this mobile home approved?